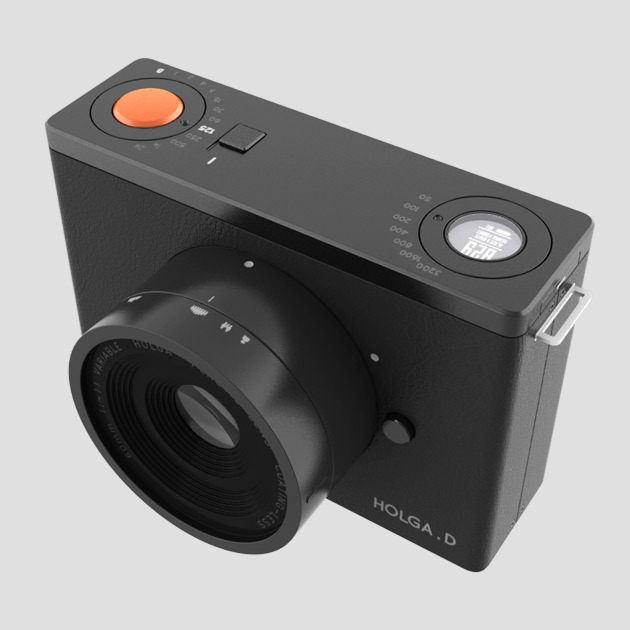 Holga D is a digital camera inspired from the extremely popular cult of Holga and other toy cameras of its kind. Even though it's a digital camera, it retains the qualities and simplicity of the original Holga camera and brings back the joy and delayed gratification associated with good old analog photography. it is an inexpensive, medium format 120 film toy camera, known for its whimsical and surreal images. It's low-cost construction and simple meniscus plastic lens often crates vignetting, blur, light leaks, and other 'qualities' that's unacceptable in the mainstream photography. But the quality problems have obtained a major cult following among some photographers, and has become really popular in recent years. In the old days of analog photography one had to wait, wait for finishing an entire roll of film, wait for development and so on. But now, in the age of digital photography many photographers agree that the anticipation and delayed gratification of analog photography made the overall experience of photography even sweeter! From the front it may look like just another digital camera, may be a bit minimal, but the backside is surprising, as it does not have a display! Even though Holga D is a digital camera, in order to achieve its simplicity, it reduces the feature set to absolute minimum. Even the display is not there! So your photographs remain mysterious until you download the images. This makes the experience quite similar to the good old film based cameras. The features... or the lack of it! 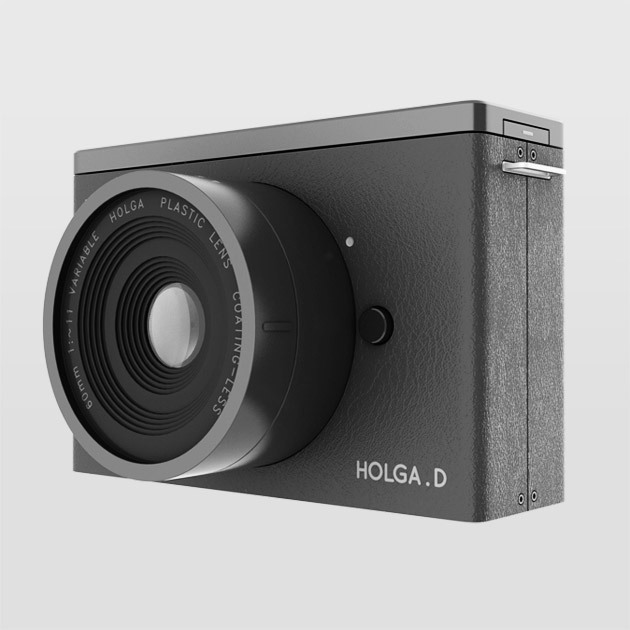 The biggest 'feature' of the Holga D is lack of features! It has absolute bare minimum feature set that you need for unobtrusive photography. It comes with a Last-Generation full frame or 1.5x crop sensor. Last-Generation sensors are basically outdated sensor from the mainstream market, for example, when the minimum resolution available in the mainstream market is 24mega-pixel, 12mega-pixel sensors would be the Last-generation sensor. There would be many other 'enhancements', like not adding the micro-lenses to the sensor. Which would reduce cost and might increase the vignetting other inaccuracies. It might not be desirable for common purpose photography but these effects are very much desirable for the toy camera shooters. The original Holga camera has very few controls, a 2 speed shutter, 2 apertures and very basic focusing ring. Holga D is aimed for similar rudimentary controls, but as it's a digital camera and as it has a electronic shutter there are some change in functionalities in order to make it useful. 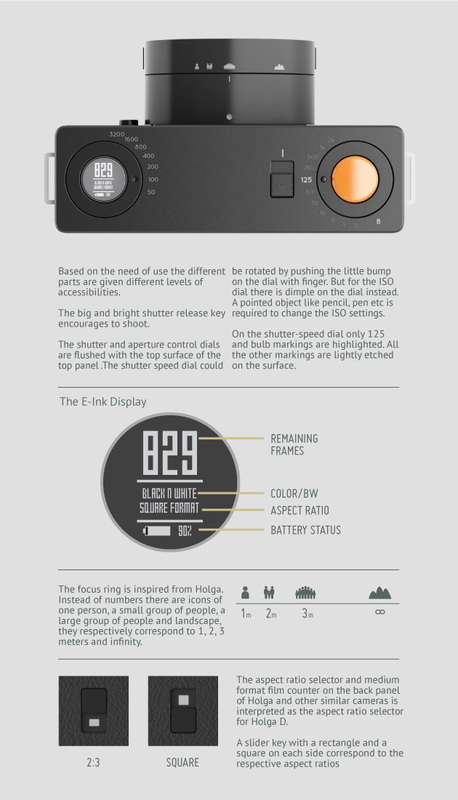 On one side of the top panel there is a big shutter release key, and on the other side a same sized E-Ink display. Surrounding these there are two ring-dials for ISO and shutter speed control. There is a power-key on next to the shutter speed dial. The entire top panel can be removed and reversed for left hand use. On the back panel there is a key to select between 3:2 or square aspect ratio, this is inspired from existing Holga cameras aspect ratio selector and film counter slider. Near the upper edge there is a port for accessories like viewfinder, flash, flash-shoe etc. On the front panel there is a push button for unlocking the lens. It's also used for changing the aperture manually. The aperture is changed by placing disks with different sizes of openings. Few such aperture disks would come with each lens, but one could easily make custom aperture using metal foils, black paper or plastic. At the bottom there is a key to select color and black or white mode. And there are battery door and sd-card bay. Although the world is moving towards equality, camera has always remained biased for right handed users! On Holga D the top panel is removable, making it possible to position the shutter release key on the left side. This makes it much more suitable for left handed users. When the top panel is positioned for left handed use, the display also orients itself. Although the basic Holga D has enough features for everyday shooting, additional accessories can be used to add extra features like flash, viewfinder etc. The back panel has a simple accessory port with rudimentary electronic contacts. Accessories with or without electronic contacts can be used in the same port. For example the viewfinder does not use it but fits into the same port, the hot-shot uses the electronic contact to synchronize the flash and the mini-flash uses it to for both drawing the electrical energy as well as flash sync. For toy cameras you don't need to use view finder, you just point the camera and shoot and wait for the 'happy accidents'. But if someone really would like to have bit more precision or wants to shoot landscape they could use the view-finders. Here are some of the concept sketches from the initial phase of the concept development. 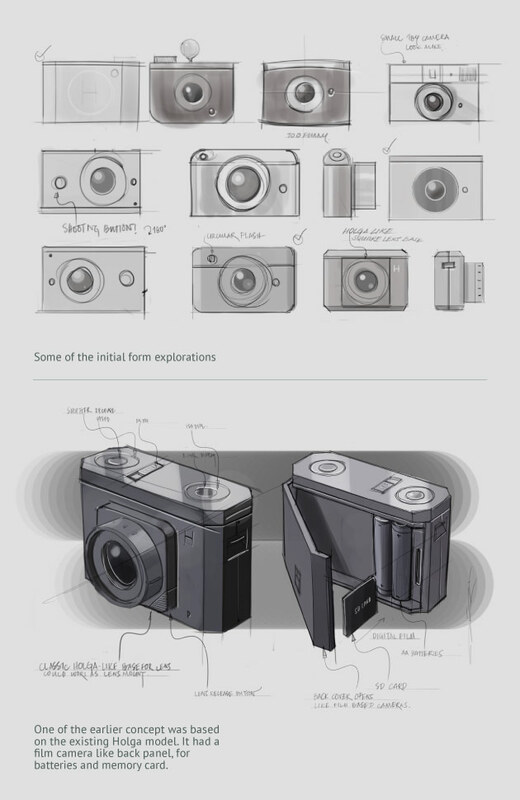 Some of the initial concepts were based on old 120 and 35mm point and shoot or range finder camera for the nostalgic association . Initially one option was to have the overall form based on the existing Holga cameras. As opening the back panel of the camera is very much associated with the film based camera for changing film this concept had had the battey and memory card bay under the back panel. But later a much simpler geometric form was developed and the batteries and memory card slot were moved at the bottom. In past few weeks there has been a huge amount of positive feedback and inquiries about Holga.D. co-developed by like minded enthusiasts and professionals from all related fields. This kind of open-source camera would open up a lot of new possibilities. 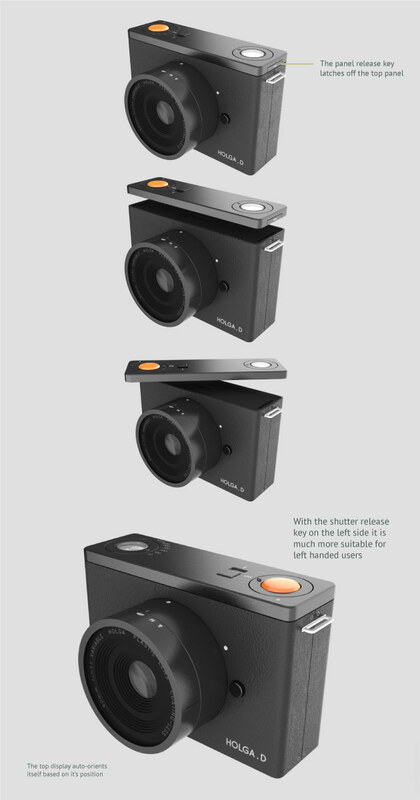 Find out more detail about the proposal of Open-source camera platform here. 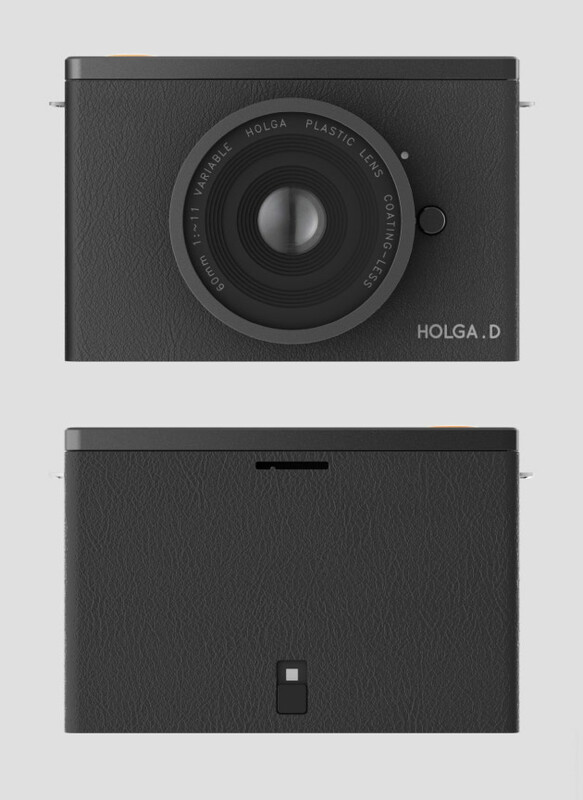 I would like to know your thoughts, ideas, constructive feedback about the proposal of making Holga D an open source camera. Please join the conversation. Most importantly, it would be great if you could spread the word and pull in people who you think would be able to contribute to the development of Holga D.
If you have any question about Holga D please post them here.